NHDC has now issued a summary of this survey – and said the scheme has “overwhelming positive feedback” – read it here, with more details here. Further consultation is promised, with a report likely at the NHDC Cabinet meeting on September 25th. 1. Support the principle of investment in the market and a refurbished shopping centre rather than wholesale redevelopment of the Churchgate centre and surrounding area. 2. Question the Council’s intended process and schedule – interested parties need to be able to have their say before plans are finalised. 3. There are two main items which need further consultation: a) design of the shopping centre refurbishment b) plans for the market. 4. Express concern that the current drawings show the market separated from the shops. This is under the guise of creating a new public space. 1. There is no vision or context. The fundamental problem with the survey is that the questions on Churchgate (& indeed, Hitchin Market as well) are asked in isolation of anything else. How does Churchgate relate to / balance commercially & in other ways, the rest of the town centre? Indeed, what is the vision for the role of Hitchin town centre? What is the unique character of HTC, its unique selling points? This could lead to discussion about independent retailing, the town centre as the social as well as commercial heart of the town, how Churchgate & Hitchin Market contribute to this & how they could do it better. None of this is touched on in the survey. 2. The survey inappropriately emphasises shopping. Q11, 12 & 13 are largely about what kind of food outlets/shops people would like to see in Churchgate. This is rather pointless; the type of shops or restaurants will be determined by the commercial market, not by the Council & indeed, the Council has no expertise in this area. 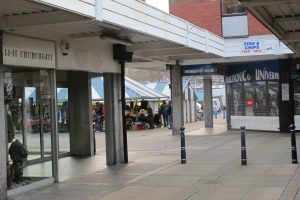 However, by identifying a vision for the town centre and Hitchin’s unique selling points, particular commercial operations may be attracted to contribute. 3. There should be greater consideration of the town centre as the social heart of Hitchin. Q8 alone mentions “leisure facilities”. As the principle funder of the project, the Council should ensure that there is more than just retail and aim for a balance of environmental, social & economic benefits. Perhaps there should be an emphasis on families with a children’s play space or a flexible meeting room space for local groups; you will doubtless have other suggestions. 4. Refurbishment of Churchgate. We recommend that you support regeneration of Churchgate by refurbishing the existing buildings (Q10). However, it should be noted that Q10 only refers to regenerating it “to provide improved shop units, i.e. updating the existing buildings”. Q9 mentions “more attractive environment & more attractive buildings/shop fronts”. We would expect Conservation Area principles to be rigorously applied to ensure the best possible design in terms of its sensitive position on Market Place and in creating attractive, welcoming spaces. 5. The survey also treats Hitchin Market in isolation from the rest of the town and fails to recognise what it means that Hitchin is a Market Town. Be wary of what is termed “the principle of regenerating public space to the rear of Churchgate”. Q14 actually refers to NHDC’s proposal to move Hitchin Market further away from the shops to create a ‘new public space’. While it might benefit both shops and the Market to have more space between them than at present, what is actually proposed would disadvantage the Market by moving it away from the retail centre of the town and towards Queen Street. 6. Support for investing in the Market. Q19 (Do you support the principle of investing in Hitchin’s market to ensure it is fit for the 21st century?) can be supported, but of course there is considerable debate to be had about how many and what kind of stalls, what mix of permanent/demountable stalls, flexibility to cater for different days, layouts, whether there should be a floating canopy over part of the Market etc etc. 7. What is the process the Council intends to follow on this project? For a start, there needs to be meaningful consultation, not just an online questionnaire. Comprehensive consultation with public and traders before a scheme is finalised means involving market traders, Hitchin Markets Ltd, Hitchin Initiative, Churchgate traders, customers, businesses, residents. There needs to be opportunity to discuss and address what are very complex issues, starting with the character of the town and what it needs. How is this going to be achieved?